Manchester United have released injury-plagued midfielder Owen Hargreaves after deciding not to extend his contract beyond this summer. The £17m signing from Bayern Munich has made only 39 appearances for United since he joined them in July 2007. "This has been a difficult decision knowing how hard the lad has worked to win back his fitness," United boss Sir Alex Ferguson told the Mail on Sunday. "But we've made it hoping he'll be able to resurrect his career elsewhere." 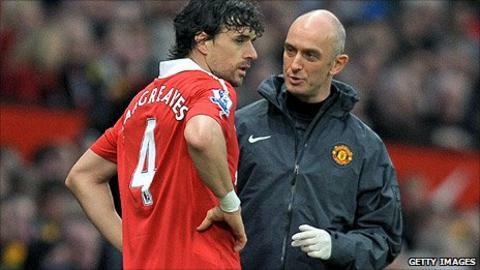 Hargreaves, 30, helped United win the Premier League title in his debut season and played in the Champions League final victory against Chelsea in May 2008 in Moscow. The combative midfielder scored in the penalty shoot-out against the Blues but since then he has hardly figured for the Old Trafford club. He has suffered from tendinitis in both knees and his recovery from surgery to cure the problem saw him mainly restricted to the sidelines. Last season Hargreaves appeared only once in the first-team, as a 93rd-minute substitute at Sunderland in May 2010. In the current campaign, he started against Wolves in November but went off after only 10 minutes with a hamstring injury.